In this volume, Emily Byrne Curtis looks at the important role that glass imported from China played in Tibetan culture. And Beatrice Scheer Smith details how a study of lead content revealed previously unknown information about New England Pomona glass. 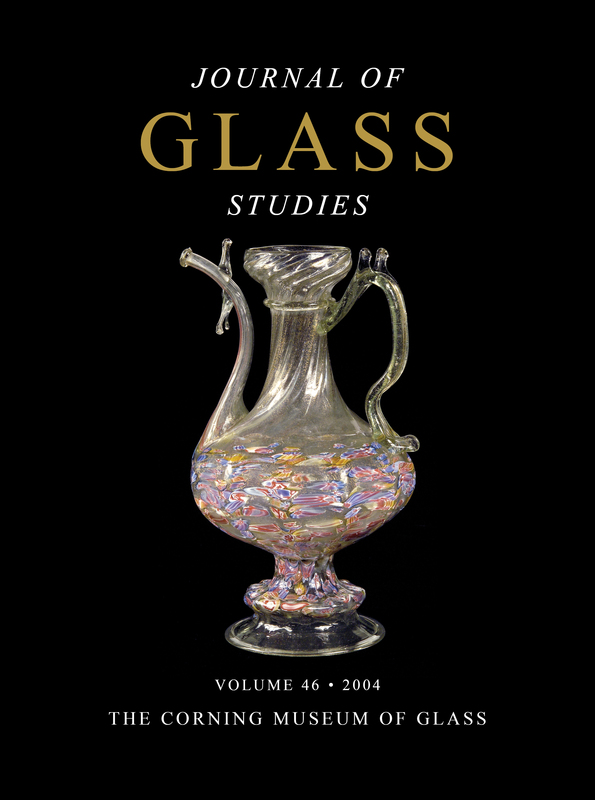 This volume also features studies of glass from the late Hellenistic and Byzantine periods. In addition, important recent acquisitions, with pictures, are listed. The important role of Syro-Palestine as a major glass production center during the late Hellenistic period is an accepted assumption. This article collects all of the available data and provides new evidence from numerous excavated sites in the region. Most of these sites are located in Israel, which was widely excavated in controlled archeological digs and researched in recent years. Additional sites in Jordan, Lebanon, and Syria are also examined. The Hasmonean destruction layers of some sites in Israel, as documented in the historical sources, are corroborated in the excavations, thus providing a fixed chronological frame for the glass vessels. The discussion is according to vessel typology and manufacturing technique, with reference to the sites and contexts in which the vessels were found. A glass plate recently found in the Khârga Oasis, Egypt, and a handful of similar pieces from other sites represent a new class of cast glass plates. The form of these large plates derives from that of silver vessels and shows that these glass objects were luxury articles. The cut and incised figural decoration, which appears on the surface of one plate in this group, is also seen in the ornamentation of silverware. This plate was uncovered in an early second-century A.D. grave in Albenga (ancient Albingaunum), Italy. It relates the entire group of plates to faceted glass with honeycomb patterns. The plate from Albenga is engraved with mythological characters, and it was produced between the late first and early second centuries. The find from Khârga Oasis suggests that this group of plates was made in Egypt. In this article, the author argues that the three figural scenes on a unique early Byzantine jug in the Ernesto Wolf Collection, Stuttgart, depict, not a stylite, as was previously thought, but three stages in the Passion of Christ: the Crucifixion, the removal from the Cross, and the entombment. The jug may preserve a design that was originally used to adorn pilgrim vessels from the tomb of Christ in the Church of the Anastasis, Jerusalem. The article also considers a series of early Byzantine jugs or bottles that apparently depict a cowled human bust above a circle containing a cross, all upon a column. The author contends that this scene, which is traditionally identified as a stylite perched upon his column, actually depicts a monk celebrating the Eucharist on a circular, three-legged altar table. These jugs or bottles may have been used as altarware or to hold altar wine. This article presents the discovery of a primary glass furnace at Apollonia-Arsuf, Israel, an addition to the two glass furnaces discovered in the 1950 excavations at the site. The new furnace consists of a melting chamber (tank) and two firing chambers, in an east–west axis. The raw glass produced at the site was blue, greenish blue, yellowish green, and yellowish brown glass of fair quality. Chemical analysis showed that it is soda-lime-silica glass typical of late Roman/Byzantine and early Islamic raw glass. According to the excavations, the furnace is probably of late Byzantine date, but a later dating in the early Islamic period is also plausible. The new evidence from Apollonia-Arsuf strengthens the assumption that this was a major center for primary and probably secondary glass production. The importance of Apollonia-Arsuf as a pre-Islamic urban center, as documented in Byzantine sources, could hint at the role of the church in the production and circulation of raw glass produced at the site. Chemical analyses of Roman, post-Roman, and early Islamic glass from Qal’at Sem’an in northern Syria indicate that three types of glass compositions were used to produce soda glass objects during this period. Roman and early Byzantine raw glass materials, based on mineral soda sources and a well-defined and relatively constant compositional source of silica, were employed in Roman, early Christian, and Mamluk times. This suggests the recycling or use of old raw glass ingots. The glass of Islamic date that is found at this and many other sites in the region is based on soda plant ash and more variable sources of silica. It appears that objects that are typologically related to those of the late Roman and pre-Islamic periods (early Christian) are made of glass that is compositionally similar to traditional Roman glasses. However, these compositions show slightly higher amounts of potash, magnesia, and alumina than are found in Roman glass. We suggest that these glasses were produced in the seventh and eighth centuries, using recycled glass of Roman composition with the addition of some soda plant ash to improve the viscosity of the batch materials. Such glass is rare in Continental Europe, where glassmakers were restricted to the use of cullet in recycling because there was no local source of soda plant ash to improve the composition of the batch. However, the presence of soda glass with slightly higher potash and magnesia contents in 12th-century blue cathedral glass suggests that this practice continued for a long time. At Zalavár, in the marshes west of Balaton Lake, a pilgrims’ church (L. 50 m) dedicated to the martyr Hadrian, together with its neighboring glassworks, was excavated. It was probably built and consecrated between about 855 and 870. Most of its windowpanes were made of low-calcium green and blue glass. This glass, of almost Roman composition, was colored by blending raw glass with Roman tesserae opacified by calcium antimonate. The local glassworks used peculiarly shaped crucibles. High-calcium sea-green and olive windowpanes, colored by divalent iron, were painted with human figures and lettering composed of silver yellow and copper red stains. Both varieties of soda-lime glass investigated at Zalavár are found, with comparable compositions, in the Carolingian monasteries of Lorsch, Fulda, Corvey, and San Vincenzo. One of the most important archeological sites in the northern Venetian lagoon is S. Lorenzo di Ammiana. Since 1969, this area has been the subject of detailed archival research and archeological investigation. During the excavations, more than 50 fragments of flat glass were found. Their edges were grozed, and it is almost certain that they were pieces of one or more small colored windows. Five samples were studied by X-ray microanalysis. The chemical composition revealed that they are likely to have come from glass made between the ninth and 11th centuries. A piece of pale green glass is decorated on one side with unusual opaque dark reddish brown lines (probably part of a face). X-ray microanalysis showed that the decoration is a glass layer 10–20 µm thick, with a concentration (about 3 weight %) of silver, probably obtained by a technique similar to silver staining. Šabbeṯay Donnolo (913–982 or later), the first Jewish medical author in western Europe, lived and presumably died in southern Italy. His principal work, the Sefer ḥaḵmônî, written between 946 and 982, contains three references to glass and glassmaking. The first reference describes a transparent glass vessel, and the second refers briefly to glassmaking. In the third reference, Donnolo describes gathering molten glass on a blowpipe and forming it into a vessel. The passage does not appear to be borrowed from another source, and it is presumably based on firsthand observation in southern Italy. It is a welcome addition to the small body of published information about glass and glassmaking in this region during the central Middle Ages. The richest source of archeological evidence, the Benedictine abbey of San Vincenzo al Volturno, was destroyed in 881, and it is difficult to determine how much of the glass from later deposits was residual and how much was new. The ninth- to late 11th-century deposits at Otranto contained goblets, bottles, and two exceptional objects that may have been imported. The history of the abbey of Saint-Jean-des-Vignes extends back to the 11th century, but the buildings themselves are now in ruins. Archeological excavations there have uncovered a number of stained glass window fragments, presumably of different dates. The fragments have been examined microscopically, and chemical analyses were performed on 76 of them. The chemical data were treated both graphically and by multivariate statistical methods that yielded four distinct types of chemical compositions. Three are potash-lime glasses, while the fourth consists of various soda-lime glasses. The three potash-lime types are distinguishable from one another by their K2O, CaO, MgO, and P2O5 contents. The findings have been compared with those for stained glasses from 29 other European locations. Chemical matches were found for all three potash-lime types. It is hoped that the results will serve as a model for establishing definitive chronological and geographical classifications of stained glasses as new and more comprehensive data become available in the future. According to ancient Chinese records, contacts between China and Tibet can be traced back to the period between 1028 and 257 B.C., when Tibetan Qiang and other tribes traded in adjoining provinces. Imported luxury glass wares played a significant and understudied role in this trade, which flourished during the 18th century. The source of the glass intended for Tibetan trade was probably the commercial workshops in Boshan, Shandong, which were known for their sturdy opaque and translucent wares. One of the rarer trade items was the glass bowl for Tibetan butter tea. Chinese glass for tribute was fashioned at the imperial workshops, and Beijing palace records provide detailed documentation of gifts bestowed by the emperor on the Dalai and Panchen Lamas. This article presents a study of these references and touches upon the attendant paraphernalia associated with Lamaist temples and halls of worship. In Venice, when important banquets were held in formal settings, tables were fashionably decorated with complex figural arrangements that displayed dishes of hors d’oeuvres, sweetmeats, and fruit. These decorations were called, in Italian, trionfi (triumphs) or deseri, a term with a much broader meaning than the dessert of French derivation. They could have been made of a variety of materials, such as sugar, wax, porcelain, and wood, but in 18th-century Venice, they were primarily made of glass. Brief but intriguing descriptions of such glass table decorations are included in the payment records of the Ufficiali alle Rason Vecchie, which are housed in the National Archive of Venice. This office recorded expenses that were incurred when famous figures visited Venice, as well as the values of gifts that Venetian magistrates sent abroad. The records show that the glass decorations could be very large (up to eight meters in length) and very expensive. Most of them were formal garden scenes consisting of fountains, garden paths, flower beds, and trees, surrounded by balustrades, arches, doors, and pedestals with statues. They were illuminated by candles in cornucopias that were mounted in metal boxes. Mirrors served as the bases for these scenes, which were also constructed with small panes of glass. For this reason, numerous payments were made to mirror makers. The name most prominently associated with the glass gardens is that of Giuseppe Briati, the most famous Venetian glassmaker of the 18th century. A strong case can be made for the argument that Briati, rather than contemporaneous lampworkers, fashioned these table decorations. New England Glass Works factory mixing-room notebooks dated from 1870 to 1893 record the production and chemical composition of Pomona. This homogeneous, colorless lead glass is characterized by its acid-etched and mineral-stained surface decoration. The costly initial hand etching was soon replaced by a simpler etching method. The batch books reveal that, at the same time, the lead content of the glass mix was reduced by at least one-half, which spawned the concept of Pomona as a glass of inferior quality (i.e., lower lead content). The percentage of lead oxide in 23 Pomona objects was determined by qualitative energy-dispersive X-ray fluorescence analysis. All of the tested objects contained 25–40-percent lead oxide, the company’s best glass formulation. A hypothesis is offered to explain the seeming conflict between these results and the batch-book records. Factory records place Pomona production only in the years 1885–1887. Although notations of a low-lead formula in 1893 suggest an attempt to revive Pomona, the 25–30-percent lead content of a Pomona goblet inscribed “1893” does not support this theory. No low-lead Pomona has yet been found, and production after 1885–1887 cannot be substantiated. Lead-content analysis also allows us to identify Pomona reproductions and Midwestern imitations. Tested examples of such glass contain little or no lead.